This article reports on the Women’s Hearing on Sexual Violence during the Khmer Rouge Regime organized by CDP in 2011. 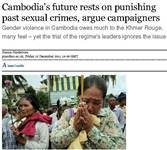 This article reports on the Women’s Hearing on Sexual Violence during the Khmer Rouge Regime held in 2011. In this article, testifiers of the Women’s Hearing on Sexual Violence During the Khmer Rouge Regime organized by CDP in 2011 are interviewed.